Got 145-Harakka III (1/3) just finalized. This beauty will be put to building queue, I just need more time. This turned out rather nice. Tail is box-structure and the lines are much more elegant than previous Harakka’s. Same wing structure as in other 1/3-Harakkas with minor detail changes at wing tips. I have a plan to build a replica of the Harakka III scale 1/1 for experiment. 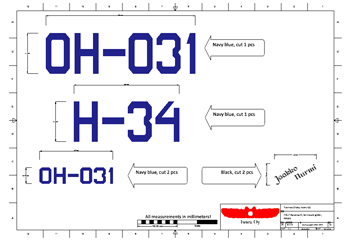 Could you please help in providing the coordinates of some companies that might do the cutting. I am rather on tight budget. I’m quite sorry that I cannot provide you pointers regarding building of 1:1 planes. I provide plans of model aeroplanes, designing and building 1:1 planes is totally another story. You can find local laser cutting services from your local area using yellow pages and similar services.